As stated yesterday, Sonic the Hedgehog 4: Episode 2 has been officially announced today over at GameSpot with a teaser trailer that reveals a new playable character. Unexpected though, an interview with Ken Balough came with it revealing more details about this episode. Balough says SEGA has listened to fan feedback from Episode 1 and in response they have added a new graphics engine, a new physics engine and fixed the uncurling. 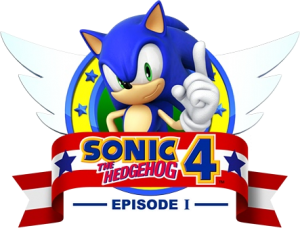 Sonic the Hedgehog 4: Episode 2 will be released in 2012 on Xbox Live Arcade, PlayStation Nework, iOS, Windows Phone 7 and Android devices. Yes, it doesn’t appear to be coming to any Nintendo platforms, unfortunately. Sonic fans over at the SEGA Forums have cracked SEGA Digital Brand Manager Ken Balough’s riddle, and the man himself has taken to the forums to make the answer official. 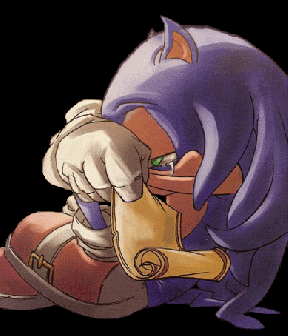 Sonic the Hedgehog 4: Episode 2 will be announced at Gamespot tomorrow (December 29th 2011) with a trailer. Xbox 360 and PS3 owners will be able to download the trailer the next day and a few days later respectively. GameSpot.com showcased a live demo of the PS3 and Xbox 360 versions of Sonic Generations this evening with SEGA’s Patrick Riley and the game’s director Hiroshi Miyamoto. In the demonstration is more of Green Hill Zone as well as an unexpected showing of the newly revealed stage City Escape, which was only shown behind closed doors up until now. Like with Green Hill Zone, the stage has been revamped for both Classic Sonic and Modern Sonic, and as we told you in our eyes on preview, the GUN truck returns and is now more dangerous than before. Anyway, what are you still reading this article for? Check out the gameplay videos of both Acts above courtesy of SSMB member Dusk Golem. If you want to watch the whole demo, including more footage from Green Hill Zone and the full Q&A, SSMB member Woun has uploaded the whole thing to YouTube. We have that for you below. Thanks to Dusk Golem and Woun at the SSMB for the YouTube uploads! It appears GameSpot managed to grab three more Sonic Generations screenshots after the game’s proper unveiling on Monday. The three images show more of the Green Hill Zone in both Classic Sonic and Modern Sonic versions and the above screenshot in particular really shows how pretty the game is graphically. Thanks to Blue Blood at the SSMB and Rickyrick in the comments of a previous article for the heads up! Gamespot has released the latest episode of their On The Spot show and featured in the show is the second part of their Sonic Free Riders final build demonstration that they promised last week. This time SEGA’s Fabian Doehla and a fellow colleague show how the co-operative Tag Mode works, while also showing a new track based in a city at night. Tag Mode sees you and another player join hands and work together as one, but you are able to separate during a race and change to a split-screen view. If you want to rejoin each other, the further ahead of you can wait at certain points in the track for the other to catch up and sync back up with you. When asked about photo features, Doehla says you’ll be able to take photos of yourself and put them on the in-game billboards. The demonstration also features plenty of voice clips from Sonic and Tails’ new voice actors. Thanks to Hero of Legend at the SSMB for the YouTube conversion! As part of their On The Spot show, Gamespot has posted the first of 2 parts of a Daily Demo of Sonic Free Riders, in which SEGA’s Sam Mullen is on board to show off the final build of the game. In this part we get to see various modes available in the menus, including World Grand Prix, Time Attack, Free Race, Tag Race, Relay Race and Tutorials, which Mullen navigates with the recently revealed voice recognition feature. We’re given a brief tease of the World Grand Prix (story mode), in which we see Eggman ruling the tournament dressed like a king. This mode looks to be played from 4 teams of characters available. Shadow, Rouge and a new blue E-Series robot, which we assume will be called E-10000B, since he’s blue. A silhouette of Eggman can also be seen. Maybe this is a final/last story unlockable? Speaking of characters, we see quite a few new entries to the roster, some you may have seen in yesterdays trailer and others brand new. Shadow, Cream, Rouge, Blaze, Silver and Vector will all be included in the game as playable characters. We get a taste of Wave’s new voice actress at the end of the video, where Sam demos the volcanic themed track shown in screenshots yesterday with her on the returning Hang-On bike. Gamespots Ricardo Torres says we can expect part 2 of their demo next week, in which they’ll be showing the multiplayer modes of the game, including a new “Date Mode”. We’ll keep an eye out for the demo and bring you all of the new information revealed. Along with his impressions of Sonic Colours, Gamespot’s Mark Walton has also posted his impressions of Sonic the Hedgehog 4: Episode 1. Those of you sick of hearing about Splash Hill Zone will be glad to see the preview is focused entirely on Lost Labyrinth Zone. 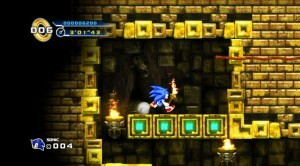 Walton begins with Lost Labyrinth Zone Act 2, which is entirely dark apart from a small amount of light given off by a torch that Sonic carries through the Act. Not only does this torch aid you visually, but you’ll need it for puzzles. One puzzle sees Sonic in a room where he has to light lanterns in the correct order to release platforms, or else they disappear before Sonic can make his escape. Another couple of puzzles are based around lighting dynamite that Sonic will have to light to explode large blocks. The lack of light was used for several puzzles in the zone. In one area, there were lanterns on the wall, which we could ignite using the torch. Each lantern extended a platform, which we needed to climb up to escape the room. However, the lanterns had to be lit in a certain order and at a particular time; otherwise, the platforms would disappear before we could make it all the way to the top. Later in the level, we found another use for our fire torch: igniting dynamite. Some large stones blocked our path, which rather handily had dynamite attached to them, along with a fuse. By igniting the fuse, we could blow up the blocks and clear the path. Another area had several explosive blocks in it. We had to carefully choose which blocks to ignite and which to leave in place so we could jump up to a secret area at the top of the screen. Other classic platform game traps are built around boulders, Walton explains. One point has you time jumps to avoid being hit by falling boulders, while in another you have to jump on a rolling boulder and move your analogue stick/press your d-pad left and right to maintain Sonic’s balance. The dynamite section was swiftly followed by one involving boulders, which dropped down into a pit below. We had to time our jumps just right to make it across the pit without falling into it. Later, a boulder was released from behind us Indiana Jones-style. Rather than just run away, Sonic jumped on it and we had to maintain our balance by pressing left or right while it rolled down a long track. Walton then talks about the infamous minecart, which if you’ve been keeping up to date, you’ll know has been revised in the console versions of the game. The minecart is now limited to a small portion of the stage and is no longer motion controlled, it instead rolls along while you make a few jumps to avoid hazards and falls. The final section of the level featured a mine cart sequence, which required some quick reflexes. After jumping into a cart, we sped off down a long track where we had to jump over obstacles and avoid falling down bottomless pits. The lack of light made it difficult to see upcoming hazards, so we had to be especially alert to make it out alive. Walton says that fans should rest assured that while these are new mechanics, you’ll still find plenty of familiar classic elements in the stage. While these sections added something new to the series, we found there was still plenty of classic Sonic action. All the loops, springs, and insane speed from the original games were there, along with plenty of tricky water hazards and spikes to avoid. At the end of the preview, Walton reveals the game now incorporates a world map instead of a basic stage select screen. Though we weren’t able to try it out, we spotted a casino-themed level on the world map screen, which indicates there is still plenty more to be revealed about Sonic’s HD outing. TSS founder Svend Joscelyne aka Dreadknux, who also played the game at SEGA’s press event last week has confirmed this world map screen in a post at the SSMB. Joscelyne then revealed that classic progression is an option, so you don’t have to return to the world map if you don’t want to. I forgot to mention. There’s a choice, actually, of whether you want classic progression or not. Once you pass that Act Clear marker, and the score counts down, a button will appear at the bottom of the screen (I think it was Triangle on the PS3 preview version or something), that says “Jump to Next Act.” If you don’t do this before the fadeout, you go back to the World Map screen. What do you think of the preview? Are you happy with the change to a world map? Discuss in the comments. 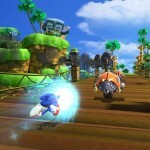 Gamespot’s Mark Walton has posted up a preview of his recent hands-on time with Sonic Colours‘ Planet Wisp stage. The preview is very positive, so much so that he claims the game “is a marked departure” for Sonic, due to the lack of gimmicks which many in the press have rated the Sonic series down for in the past. Sonic Colors is a marked departure for the little hedgehog that could; you don’t turn into a werehog or wield a giant sword. In fact, there is a distinct lack of gimmickry about the game, which instead offers a purer 3D experience not seen since the likes of Sonic Adventure on the Dreamcast. There are tons of fast loops to roll through and springs to leap from, as well as new wisp power-ups that have been tuned to fit in with Sonic’s breakneck speed. 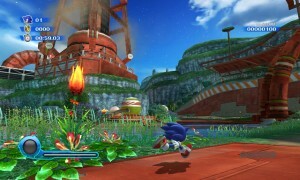 Walton reveals that Planet Wisp is in-fact the opening stage of the game and as seen in gameplay videos at Gamesom, looks very familiar to the opening stages of older Sonic titles. Our hands-on focused on the opening stage, named Planet Whisp. 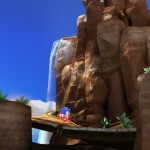 Like the opening stage of earlier Sonic games, it featured familiar visuals, with lush green plants, waterfalls, and simple badniks. Walton informs that players will need to use the B button on the Wii Remote to get around turns and that doing so will not only make you drift, but gain a speed boost too. To make our way around the huge banked curves, we had to hold down the B button, which gave us a burst of speed in the corners and made Sonic’s famous red sneakers glow bright yellow. Walton then goes on to explain the three Wisps that he got to try out, namely the Rocket, Lazer and Hover Wisps that we know all too well by know. 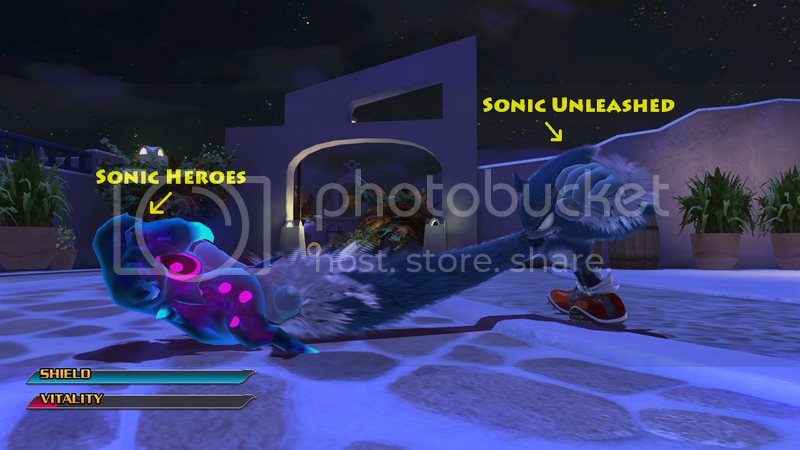 This is the first time we’ve heard of the Lazer and Hover Wisps presence in Planet Wisp, so it seems SEGA have been updating the stages to incorporate more stage exploration with the games variety of Wisp power-ups, which can only be a good thing. In Walton’s final thoughts, he seems very impressed with the games Wisp power-ups and how they build on Sonic’s gameplay when compared to past gameplay styles like Sonic Unleashed‘s Werehog. The visuals also get the thumbs-up from Walton. What stood out the most from our time with Sonic Colors was how much the power-ups have been integrated into the lightning-fast platforming that has become a hallmark of the series. Unlike the mindless werehog combat of Unleashed, the wisps serve to enhance the core gameplay experience and not drastically change the pace. The visuals in Colors also look good, and Sega has put a large amount of detail into the backgrounds, with the lush foliage-filled Planet Whisp looking particularly impressive. For the full preview, head over to Gamespot. E3 2010 is getting closer and some of the media are already kicking off their coverage including Gamespot who yesterday posted up the above Sonic 4 interview with Ken Balough who’s role is Associate Digital Brand Manager at SEGA. Ken reveals all 3 Act’s of Splash Hill Zone will be playable at E3 including the boss battle, he says they’ve taken the Special Stages(where motion control’s will now be optional) out of the demo to keep the queue moving so everyone can get to play the game. 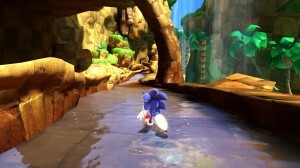 Alot of the info gained from the interview we already know from past interviews but the footage shown is new in the sense that we can just barely see some of the changes already implemented such as a fix to Sonic’s speed momentum and accelleration meaning Spin Dash is more useful, tweaks to the jump appear to have also been made so it’s less floaty. Ken says you won’t see all of the changes made in the E3 demo so we’ll have to wait until a later date to see those. Judge for yourself from the footage and see if you notice any changes then let us know your thoughts in the comments. Thanks to Sykotech at the SSMB for the heads up and thanks to Phos there for the YouTube coversion of the video. 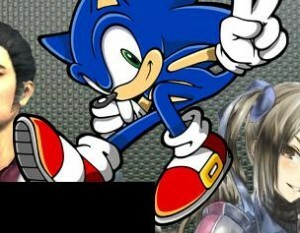 TSS Staffer nuckles87 and new member of the team Jason the Jackass will be attending E3 to bring readers of The Sonic Stadium exclusive coverage of all things Sonic aswell as bringing SEGA Bits exclusive coverage of SEGA’s other titles on the show floor so stick with us for all of your E3 Sonic needs. Just a very quick heads up, Gamespot.com have 11 new gameplay videos for Sonic & SEGA All-Stars Racing showcasing 4 player split screen action, All-Star Moves and more. Plenty to get you excited for the games release on the 23rd U.S. and 26th Europe. Note: You have to click ‘most recent’ to make them appear. We’ll keep an eye out and let you know as soon as the interview hits their website and write up any interesting information that may come from it. At the top right of Gamespot’s SEGA event page a piece of Sonic art can be spotted that is actually fan art by awesome SSMB member ENVY16. Way to use Google Gamespot, needs more credit to ENVY16 though. 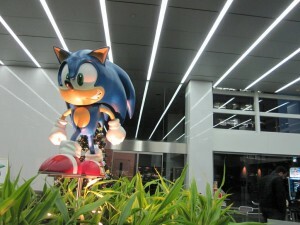 You may remember last week when we informed you that Gamespot were after user questions for their visit to SEGA’s Tokyo HQ, well they have returned and shared some photo’s from SEGA’s foyer. 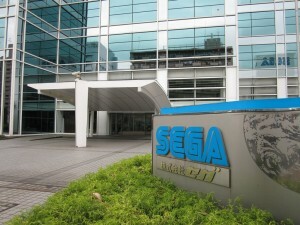 Gamespot have a nice treat lined up for SEGA fans this Christmas/New Year period as they are visiting SEGA HQ in Japan and interviewing some of their top developers about what they have planned for 2010. Gamestop aren’t stopping there though, they want to get the fans involved so their asking for you to send in your questions to put to Sega’s head of consumer business and the developers of 4 of their biggest games they have lined up for 2010 with one of the developers being the producer for Sonic Unleashed namely Toshihiro Nagoshi. Remember: We want clear and intuitive questions that will translate well and give other readers an insight into the development process and the games. Gamespot will also be having an exclusive chat with Naoya Tsurumi, former CEO of Sega America and now head of consumer business for the publisher. Make sure you check back here the week starting December 21 to see some of your questions answered. Finally, stay tuned for all the Sega coverage, including previews and video interviews launching on GameSpot on December 28! So best to start sending your questions in now rather than later. Another piece of confusion is where do fans submit their questions? Well Gamespot forgot to mention that too so it’s to be assumed their to be posted in the comments section of the article so you’ll have to sign up on their website which is free to do. 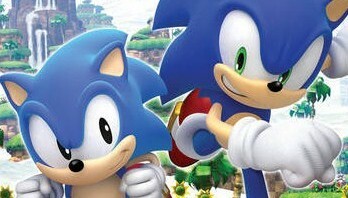 Will ‘Sonic Unleashed’ be the best Sonic game since the Dreamcast era? Sonic Teams producer and lead designer on Unleashed ‘Yoshihisa Hashimoto’ seems to think so! .:Dark.Prowl:. of SSMB gave us the heads up earlier today regarding a recent interview published by Gamespot with the lead designer of Sonic Unleashed. The interview discusses the newly developed ‘Hedgehog Engine’, playable characters such as Tails in his Tornado plane for a ‘shooting game’, the main story involving the huge beast ‘Dark Gaia’ and the option of new maps available to download over the Xbox Live and PSN service if demand is high enough. New information on the game has been a little scarce as of late despite a playable demo showing up at the Leipzig Games Convention a couple of weeks back. The interview discusses a good deal of new things and shows some promising features and compelling gameplay Sonic fans have so desperately wanted for some time now. Hang on… Haven’t we heard all of this somewhere before… though? You can check out the article for yourself here.